Lend Your Talent… IN SPACE! There are many things I love about being alive today. One of these is the ease of collaboration on creative projects what with this whole internet thing I’ve heard so much about. I have a podcast. 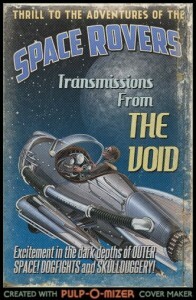 A space opera adventure serial. Once every two weeks, I assume the persona of gentleman starpilot Zeno Stede and send a ~10 minute voicemail to his sister Tira back at the home station. It’s fun. Check it out, if that’s your kind of thing. If that’s your kind of thing to write or read aloud, I’d love to hear from you. I’m sure Zeno wouldn’t mind lending the mike to a buddy for an episode. Or maybe you write or perform music, and think Tira might like to hear what the wetware bards of the Ghost Parade are playing these days. Maybe comics are your thing, or crocheted spaceliners. We should chat sometime. This is the beauty of our era: we can! Email me at wakingcassandra at gmail dot com to discuss sans pressure or just to nerd out about space. This entry was posted in podcast, Uncategorized on November 21, 2013 by gala5931.